The BBC in no way endorses any e-mails linking to this story which offer ways to make money. Anyone in the UK receiving such a letter or e-mail is advised not to reply. If you are a victim of fraud connected to such a letter or e-mail, please contact your local police computer crime unit. Several leading banks in Switzerland have been criticised by the country's regulators for accepting money from the family of the late Nigerian military ruler, Sani Abacha. 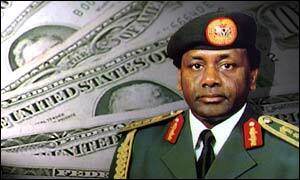 The Nigerian Government is trying to recover an estimated $3bn in embezzled state funds sent abroad during General Abacha's five-year rule. In a report, the Swiss Federal Banking Commission said 19 banks had dealings with his regime and, although they did report their suspicions of money-laundering to the Swiss authorities, they should not have accepted the money in the first place. Six banks - three branches of Crédit Suisse plus Crédit Agricole Indosuez, Union Bancaire Privée and MM Warburg - were singled out for failing to run adequate checks on new accounts, including those opened by General Abacha's two sons. "The mere fact that significant assets of dubious origin, from people close to former Nigerian President Sani Abacha, were deposited at Swiss banks is highly unsatisfactory and damages the image of Switzerland as a financial centre," Banking Commission Chairman Kurt Hauri said after the 10-month investigation. At Nigeria's request, Switzerland has frozen hundreds of millions of dollars held there, as have Luxembourg and Liechtenstein. The commission said that almost a third of the Abacha money deposited with Swiss banks had first been banked in the UK, United States and Austria. General Abacha ruled Nigeria from 1993 until his death in 1998 and, according to the current government, he used a circle of family members, close aides and business associates to dispose of the cash. It was amassed by awarding contracts to front companies, accepting massive bribes and by siphoning money direct from the Nigerian treasury.